February is here, and it’s time to be bombarded by flower and chocolate displays. Valentine’s Day is an active time for retailers, chocolate companies, and flower companies, especially when they coordinate. Consumers will go to buy the flowers, and think, why not purchase the chocolate that is sitting here too? It’s a classic move to inspire impulse purchases. While displaying related products together is common practice during the holidays, this technique can also be applied beyond occasion-specific displays. Secondary placement, also known as cross merchandising, is a successful marketing strategy that brands or retailers implement all throughout stores. The concept is simple: place a product in a nontraditional location near items that are related in the hope that shoppers will realize that they want or need it. Examples include butter and bread, candy and popcorn, chocolate and tampons, tequila and limes, lemons and seafood, and beer and diapers. The possibilities are endless, which makes this marketing strategy all the more fun. “Recipe” Combinations. These items might be commonly used together, such as tequila and limes or bread and jam. Target Market. 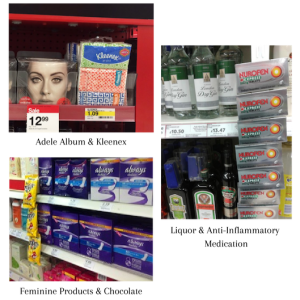 If shoppers are interested in a particular product, then they might be a target for a strategically placed secondary product as well. An example would be alcohol and Advil®. While these items aren’t typically used at the same time, someone buying alcohol might see the Advil® and remember that he or she might need a pain reliever later. If the Data Says So . . . Many companies and retailers analyze shopper baskets and move items frequently bought together closer in the store, even if the correlation seems to be a stretch. The “beer and diapers” tale is an example that we’ll explore later in the post. Secondary placements are a chance for brands and retailers to show their creative side, but they can also provide amusing photos for consumers to enjoy. Here are some of the best examples that Observa could find. Displaying flowers and chocolate together on Valentine’s Day is a smart move to stimulate more impulse purchases. More obvious examples of non-holiday placements that we found included dish soap and dishes, ketchup and hot dogs, and hair rollers and pet food. All of these items are typically used at the same time. Cross merchandising isn’t always as simple as following a recipe. Sure, ketchup is used with hot dogs most of the time, but is Advil® always bought with liquor? Not necessarily. However, target markets for products can overlap, and one product might inspire someone to impulsively purchase another. Here are some creative and funny examples of target market cross merchandising that Observa found. 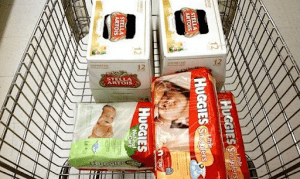 Retail folklore tells of a study done in the 1990s that found a strong correlation between diaper purchases and beer. According to the legend, a retailer tried placing diapers next to beer, and diapers sales soared. It was later discovered that the retailer’s did not actually implement this, but the high frequency of diapers and beer appearing in shopper baskets was real. Thomas Blischok, then VP of industrial consulting for NCR, did an analysis for Osco Drug of 1.2 million market baskets in 25 stores and identified over 20 different product couplings. One of the most notable (and humorous) couplings was beer and diapers, which is an easy one to remember! All Fun Aside, It Works. 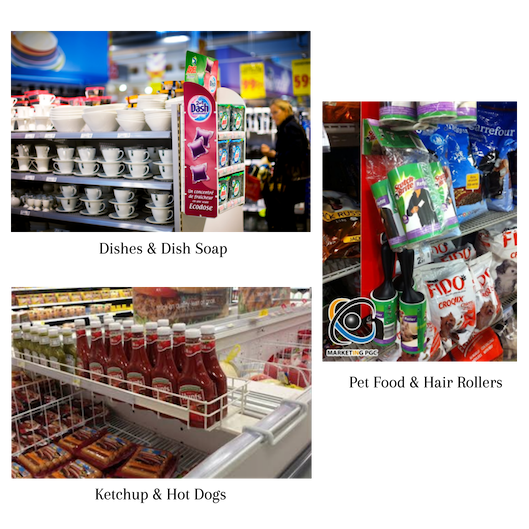 Impulse strips and other secondary merchandising tools are becoming much more common in grocery store aisles. But are these actually boosting sales? The numbers don’t lie. Forbes published a story about a popular jam brand that placed its product near waffle mix and cold meats, as jam is frequently bought with these items. The plan was to increase the odds of reaching not only the 75% of shoppers who come into a store knowing that they want jam, but also the 25% who don’t have jam on their shopping lists. This placement contributed to a massive sales boost in the first four weeks that the product was in the store. Another example comes from a hardware store that put a strip of gloves next to gardening tools rather than with other gloves in a different area of the store. The store saw a 25% increase in glove sales. Putting a strip of gloves on an endcap with lawn chemicals boosted sales even further, in this case by 177%. As always, when trying new marketing strategies, it’s extremely important to measure their impact. When trying multiple new marketing ideas simultaneously, you want to ensure that the right data is collected so that you can attribute boosts in sales to the appropriate strategy. All in all, Happy Valentine’s Day! 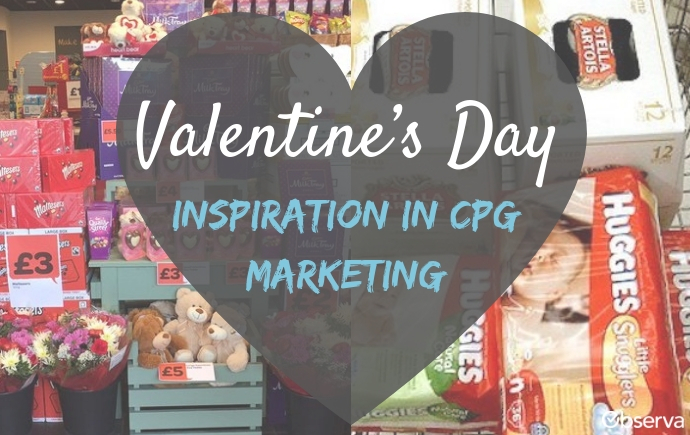 If you want a healthy relationship with your sales data, treat every merchandising day like it’s Valentine’s Day.